In the 'Los Angeles' letter mailed on March 13th 1971 the Zodiac had now laid claim to 17+ victims, with his usual jibe at police, writing the footnote SFPD-0. The letter had been mailed in Pleasanton, Alameda County, a suburb in the San Francisco Bay Area, and was addressed to the Los Angeles Times. "This is the Zodiac speaking Like I have allways said, I am crack proof. 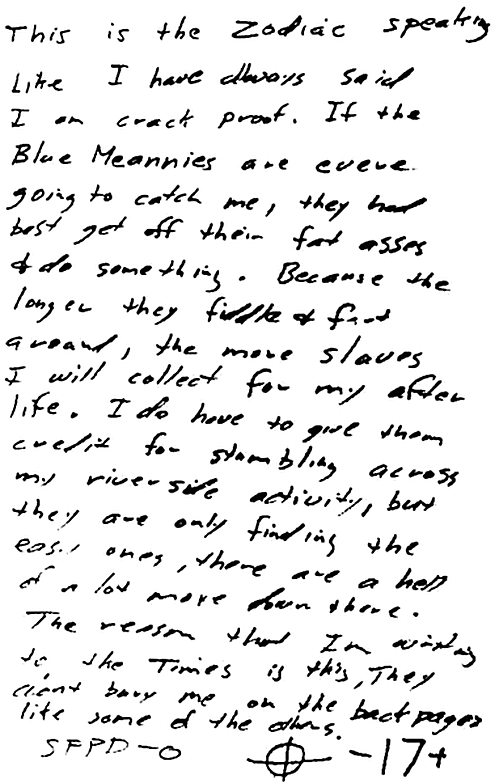 If the Blue Meannies are evere going to catch me, they had best get off their fat asses + do something. Because the longer they fiddle + fart around, the more slaves I will collect for my after life. I do have to give them credit for stumbling across my riverside activity, but they are only finding the easy ones, there are a hell of a lot more down there. The reason I'm writing to the Times is this, They don't bury me on the back pages like some of the others." 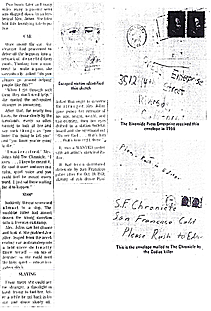 Paul Avery, a reporter at the San Francisco Chronicle found links indicating the Zodiac Killer may have been responsible for the murder of Cheri Jo Bates in Riverside on October 30th 1966 and to which the Zodiac either laid claim to, or part indicated his involvement in, by stating in this correspondence: "I do have to give them credit for stumbling across my riverside activity". However, Paul Avery was not the first person to propose a possible connection between the two cases. This was suggested at least a year earlier in a memorandum mailed from Riverside to Napa County on October 20th 1969, after a phone call days earlier between Chief of Police Thomas Kinkead and Sheriff of Napa County Earl Randol. The letter from Kinkead detailed the similarities between the cases and intimated that the information may assist investigators in the Bay Area. "It might be worthwhile to note that just outside the city limits of Riverside is located March Air Force Base, a SAC base. Physical evidence found at the scene of our crime indicated that heel prints found near the body were made by a heel that was manufactured for military and other government agencies, including prisons. We were able to lift some latent fingerprints from the victim's vehicle. These prints were not identified. Our unidentified prints are on file with the FBI under the FBI file No 32-27195, Latent case No 73096. Copies of the latent lifts from your homicide were obtained from CII and sent to the FBI for comparison with the latent lifts in our investigation." ​It would take another 13 months for Paul Avery to uncover this connection and much to the embarrassment of law enforcement published the story in the San Francisco Chronicle in an exclusive report entitled 'New Evidence in Zodiac Killings-A link to murder in Riverside' on November 16th 1970. Four months later the Zodiac Killer would respond with the above letter effectively staking his claim to the Cheri Jo Bates murder and declaring there were more crimes for which he was responsible. The San Francisco Chronicle article opened with the lines "Persuasive evidence-Turned up by The Chronicle-that Zodiac murdered a beautiful Riverside college coed four years ago may provide new and important clues leading to the capture of California's mystery killer. And a young San Bernadino woman, who eight months ago escaped a weird murder attempt by Zodiac, has given The Chronicle additional details as to what he looks like. A number of chilling similarities link the savage October 30th 1966 knife slaying of 18 year old Cheri Jo Bates with Zodiac-whose most recent boast is that he has killed 14 persons." View the full newspaper article here or to open the individual pages click the images in the sidebar. Remember to click the opened image a second time to magnify. 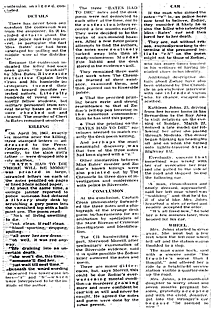 Many Riverside police investigators were reluctant to concede a link between the Cheri Jo Bates murder and the Zodiac killings in the Bay Area, although Questioned Documents Examiner Sherwood Morrill, who worked on many of the Zodiac letters, believed the Confession Letter in the Riverside case, along with handwriting from the Bates letters and the Riverside Desktop Poem to be from the Zodiac Killer. The typed Confession Letter was mailed on November 29th 1966, the Riverside Desktop Poem was discovered in the December of 1966 by a janitor at the Riverside City College library and three 'Bates letters' were mailed on April 30th 1967, sent to Joseph Bates, the Riverside Press Enterprise and the Riverside Police.